and 6.30pm to 10.30pm (Monday to Saturday). THE New Year gallops in with a medley of treats found in three mouth-watering Chinese New Year set menus from Xin Cuisine Chinese Restaurant. Xin Cuisine’s head chef Thong Pun Foo has created three delicious Feast of Prosperity sets, beginning with an appetiser most associated with Chinese New Year celebrations in Malaysia – the yee sang. “The dishes for the menus are a fusion of new and old,” said Thong on the sets, with a combination of Top Shell and Salmon Yee Sang featured in the premium menu. Another tantalising appetiser is an alternative to shark’s fin soup, the Abalone and Crabmeat Soup with a base of chicken stock. The richly-appetising Steamed Cod Fish with Watermelon Seed in Soya Sauce and Chinese Parsley carries a surprisingly subtle nutty flavour from the watermelon seeds that complement the full-flavoured fish and sharp-tasting parsley. 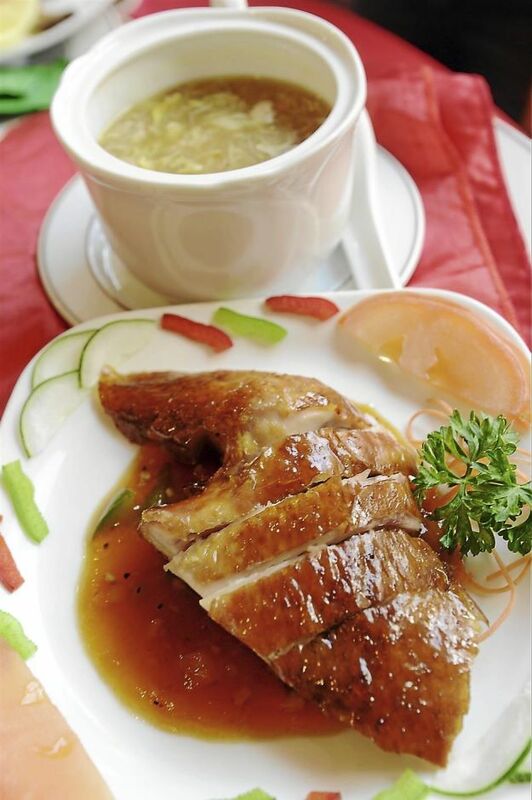 Chef Thong specialises in Cantonese cuisine with his mouth-watering creations. However, chef Thong’s signature and favourite dish is a fusion of contemporary and traditional found in Xin’s Two Varieties of Prawn Meat with Kim Chi Sauce and Long Shui Prawn Roll. It is a different take on White Sea prawns, one in the form of crunchy batter-covered prawns drizzled with Kim Chi sauce; the other in a prawn mousse and wrapped in wispy Kataifi threads pastry. “Preparations for the soft shell prawn mousse takes two hours and is cooked together with fish to bind it, then deep fried with Kataifi noodles,” said the chef, who has worked at the restaurant since 1996. 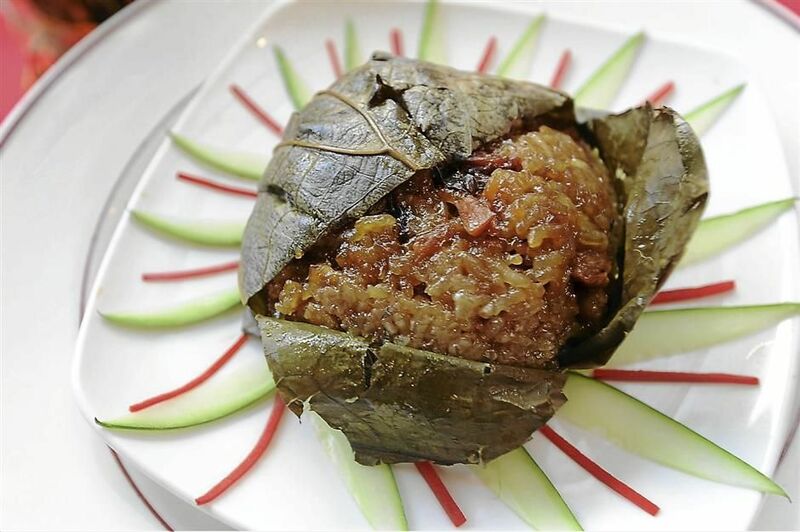 The Glutinous Rice in Lotus Leaf with Anchovies, steamed for 45 minutes in the lotus leaf with chicken ham, black mushrooms and dried shrimp, has aromatic flavours. Desserts to end the feast include the light, uncomplicated Chilled Aloe Vera as well as Red Dates and Longan, which is boiled with white fungus. There are also Two Varieties of Sweet Dim Sum consisting of a water chestnut jelly as well as a crispy Nian Gao and yam dumpling. The delicate Crispy Roasted Barbeque Honey Chicken (bottom) and the Abalone and Crabmeat Soup (top). Other specialities in Xin’s premium menu include a delicately Crispy Roasted Barbeque Honey Chicken and the Braised Pacific Clam, Dried Scallop, Black Mushroom and Broccoli. The promotion ends on Feb 14 and the restaurant will be open on Jan 30, the eve of Chinese New Year, but closed from Jan 31 to Feb 2. Xin Cuisine offers three Celebratory Masterpiece Set Menus with eight courses at RM788++, RM888++ and RM988++ respectively for 10 persons. The Yee Sang for takeaway, ranging from Salmon Yee Sang, Scallop Yee Sang, Pear and Salmon Yee Sang, Pacific Clam Yee Sang to Abalone Yee Sang, have prices beginning at RM68++ onwards.